Which title(s) have you won so far, and how did you do at the State Pageant each time? Why did you start competing in MAO locals? In 2008 at age 15. I started in the Outstanding Teen program. My platform is Meatless Monday and Move It Monday: I’ve Got the Power. It is primarily health-based and aimed at combating childhood obesity through small, easy-to-adopt steps (ie cut out meat on the first day of each week, try a new exercise plan at the beginning of the week, plan to incorporate more physical activity, etc), but it is also about creating a more compassionate world, and this is what makes it unique. Eating has become mindless, especially in America, and we are not often concerned with where our food is coming from and what exactly we are putting in our bodies. I started with the concept of “healthy body, healthy mind, healthy world,” and looked at how I could bring them together in a way that did not require drastic change. There is a disconnect between the farm and the plate, and I am working to be that link, encouraging children, and adults, to take a pledge to be conscious. Where were you when Nina won Miss America? Yes! I was also in Vegas when Mallory won Miss America. I was invited to speak at a press conference held by the Humane Society of the United States (HSUS) in the Capitol building in Hartford, CT. Several animal welfare bills were being brought up for legislation, and I was asked address the media, as well as lobby CT elected officials. This was a very special event, and connecting my platform to state legislation is something very important to me as a titleholder. I am in the beginning stages of planning a fundraiser to directly benefit the Meatless Monday campaign in conjunction with the HSUS. I have never held a fundraiser for the HSUS before, even though I tried several times in the past. This year, I want to make it happen! Swimsuit! I think that’s where my personality shows the most. I think that interview should count for the highest percentage, as opposed to talent. In my opinion, it’s more important for Miss America, or any titleholder, to be articulate, and capable of promoting her platform and the organization. 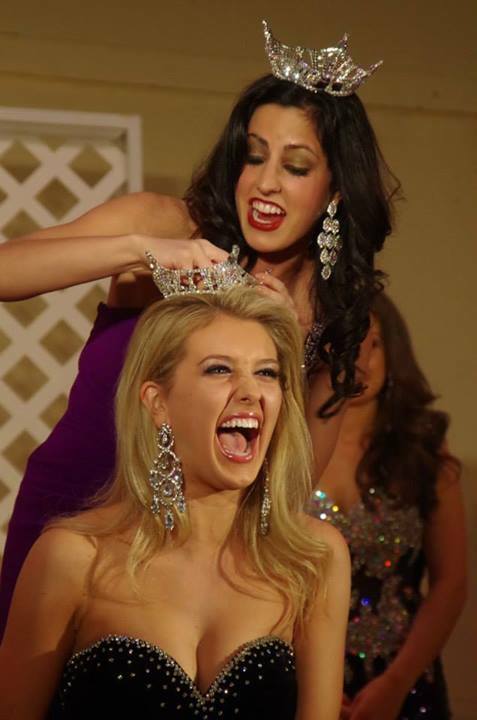 How do you prepare for pageants (either local or state)? I never stop preparing. The day after the 2013 state pageant, I was already thinking about 2014. I don’t mean that I think of nothing else, but I do mean that it’s always in the back of my mind. I always say that Miss America is not something you can study. You have to live it, experience it, and learn from it. Everything you do in your daily life is directly related, because who you are as a person in sweatpants should not be any different from who you are with a crown on your head. What advice do you have for a girl who thinks she can’t compete in pageants? Pageants are not what you think they are. I was that girl who thought I couldn’t compete. My mom asked me when I was 14 if I would be interested, and I said no. On the outside I said it was because I was too busy with school and dance, and that pageants really just weren’t my cup of tea. The real story was that I was terrified, and I never thought that I could be like those Miss Americas I had seen on TV. I eventually did decide to try competing as another chance to showcase my talent, and then I was hooked. I always say that I happened upon pageants by chance, and stayed by choice. What do you plan to do with your experiences after you age out of MAO? I know that I’ll always be involved with MAO in some capacity, whether it’s as a volunteer, local director, or coach. Everything that I’ve learned as contestant has helped me prepare for the “real world,” and has given me experience in a variety of situations. I have MAO to thank for my interview skills, networking skills, and know-how when it comes to seeking out opportunities, and taking them. A perfect example is the paid internship I was offered by a company I had worked with as Miss New York City. My career goal is to be a sports broadcaster within the scope of horse racing, and already MAO has helped set me up in the right place for the kind of job I want. Miss America is only relevant if we make it relevant. I want to be the shot of adrenaline, the outspoken voice, the advocate for compassion. I am constantly working to connect with new types of individuals, and to scale my message to different types of audiences. Yes, to some extent Miss America is a beauty pageant, and it is fun to compete and perform on stage. But Miss America is not a one night thing. It’s an entire year – or an entire lifetime, if you want it to be – of giving yourself completely. That’s why I should be Miss America. I am ready to give myself, and to help push the organization into new arenas. Miss Connecticut 2014 will take place June 28th, 2014 at The Garde Arts Center in New London. Previous PostPrevious Congrats, Miss Indiana!